Lowdown: The Edward Snowden revelations as they happened. Yours truly does not hide his admiration for Edward Snowden. I consider him to be a hero of mine, nowadays probably the hero of mine. Reading Glenn Greenwald’s award winning book on the Edward Snowden affairs my appetite was left on hunger mode: In his book, Greenwald revealed his partner in the crime of exposing the truth, Laura Poitras, filmed the duo’s historical encounter with Snowden at a Hong Kong hotel. I wanted to watch that video, and now CitizenFour (verify) gives me the opportunity to do so. You can do so, too, and quite easily so: Citizenfour is available for what seems to be perfectly legal online streaming here. Citizenfour is built around that very hotel engagement. We start off beforehand to learn where Poitras and Greenwald come from; then we have them meeting Snowden. We literally take part in those initial meetings where they learn who this Snowden guy is, it's all there on video! Kind of amazing when you think about it: Poitras shot this historical event before she knew the gold she had on her hands. As a result the rest of us can now receive the same dose of Snowden's reality checks as the Pulitzer winning journalists did. Segway-ing the recorded encounters with Edward ("I go by Ed") Snowden are segments pointing at the relevancy of what Snowden has been saying. When Snowden says Americans' phone calls are tracked, Poitras shows us a video of a government official declaring the government will never do that, etc. Indeed, there is quite a parade of blatant liars exposed for what they are by Citizenfour. The list includes this guy you might have heard of, going by the name of Obama. Proceedings are supported by numerous activists, including Julian Assange and Jacob Applebaum. Both share Snowden's refugee status to one extent or another and for similar reasons, and both are technical experts in the areas related to Snowden's exposures. Finally, Citizenfour shows us what happens when Snowden is forced to escape his Hong Kong hotel, literally running for his life (a review of the legal aspects of the case raised against him by the USA, courtesy of Poitras, makes it very clear Snowden is not going to enjoy a fair trial were he to fall into American hands). On one hand we see this very determined guy who knows exactly what he's in for, but on the other we see a human trying to cling to hope. And it's not a reenactment; it's the real thing, as it happened. We are then told of Snowden's eventual escape to Russia and receive an update from barely a few months ago on Snowden's current status. Aside of the real life drama on display, a key factor of Citizenfour is its style. There is no commentator here; we are eyewitnesses to events as they happen. What there is, aplenty, are scenes of online text chats between Snowden and the journalists. These are coupled with scenes allowing us to read some of the encrypted emails the two sides exchanged. I guess those scenes may not be everyone's cup of tea, and the online streaming version we watched struggled with the small letters, but I can see the need for such scenes given Poitras very successful attempt to let the story narrate itself. What can I say? Poitras shows us Snowden as the hero that he is. You'd have to be one of those dumb George Brandis like persons (here's proof) to watch Citizenfour and not admire Snowden for his braveness. The guy went through a lot to be able to make a stand for the truth while, at the same time, risking everything he ever had for something that could have easily ended up a useless folly. 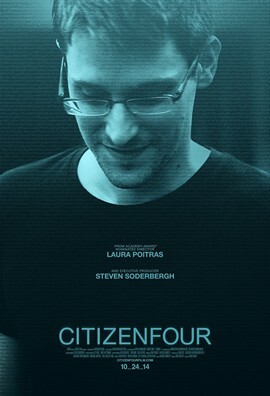 If you ask for my personal opinion on Citizenfour, rather than the cold analytical view of a movie critic, I will say that this is a movie that touched me deep inside. It touched me because I am deeply interested in matters of online liberties, security and privacy. But more importantly, for me, Citizenfour touched me because it provided me with a very detailed - voyeuristic, if I may say - look at this hero of mine. If I used to regard Snowden as a hero of mine, now I regard Snowden as the ultimate role model. If I ever to get to a point where I need to ask myself what the right course of action is, all I need to do is ask myself what would Ed do. Best scene: Snowden dyes his hair and puts on contact lenses while preparing to escape. Obviously troubled but amazingly composed at the same time. Notable scene #1: A copy of Cory Doctorow's book Homeland, discussing a fictional yet very Snowden like realistic world, lies on the shelf of Snowden's hotel room. Notable scene #2 (blooper alert! ): At the very end of Citizenfour we see Snowden at his Russian dwelling, in the company of his girlfriend, cooking a meal together. Although I suspect Snowden's is not going to be a life of tranquility, it is nice to see a bit of a happy ending at the end of an otherwise grim and serious affair. Overall: Due to its personal touch, I find rating Citizenfour a tough act. Although excellent, it does have its eccentricities, for which I will rate it at "only" 4 out of 5 truly inspired crabs. Personally, though, I find Citizenfour packs a much bigger punch than most 5 star flicks. Citizenfour won an Oscar! Hooray! It sure been a while since I actually cared about something to do with the Academy Awards. More than being award worthy, the main event with Citizenfour's recognition is the fact a conventional/conservative American institution chose to award a movie that glorifies a character the USA officially regards to be a criminal. If the Academy Awards figured Snowden is on to something, then what does it say about American government? On a completely different note, it appears as if the link I have provided above for watching Citizenfour does not lead to an official copy. I apologise for leading you on the potential path to piracy, but can assure you that was not my intention. Hell, I am far from sure regarding the legality of the copy behind the link. I will, therefore, note how easy it is to not be able to recognise whether one is looking at a legal copy of a movie or not. Perhaps the companies claiming monopoly of our culture can take note of the futility of it all?